Pelicans usually dive into the ocean in search of food, but this one just wants to help keep the swimmers safe! 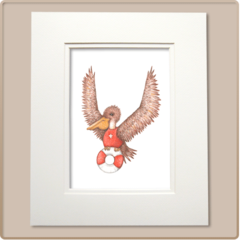 Bring this courageous little lifeguard home with the decorative pelican art print. Cowabunga!